Te Slaa MFG is now an authorized Everlast Fountain dealer. This is the first and last fountain you will ever need. Designed with Farmers and Ranchers in mind. Made with high quality US Stainless Steel. The frame is 12 gauge and the trough is one piece of 14 gauge stainless steel that overlaps the sides for superior strength. The one piece trough along with the 3″ water draining port makes cleaning easy. A water overflow option can also be added for those areas that do not have electricity. The access panel allows for repairs and gives you the option to add a sprinkler system to your cattle yard. The valve is a fiberglass full port diaphragm valve capable of filling 60 gallons in 60 seconds. It is mounted at the bottom, so it is the last thing to freeze in case of power loss. The stainless steel thermostat requires no tools to adjust it. 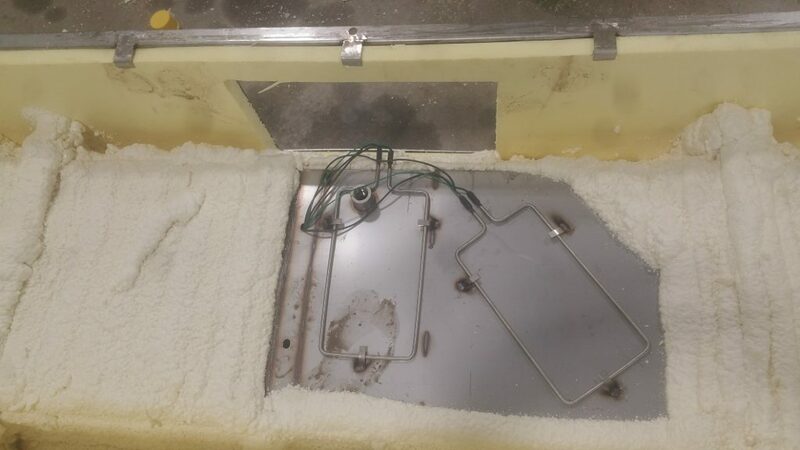 It is mounted high in the trough, so that the heating element turns on before the top of the water freezes. The fountain is equipped with two 500w stainless steel elements that are mounted under the fountain and require no tools to adjust. The fountain is insulated with spray foam insulation filling cavities, cracks, and joints.